This set is a great idea, especially for an online company selling perfumes which you can’t actually smell before buying. 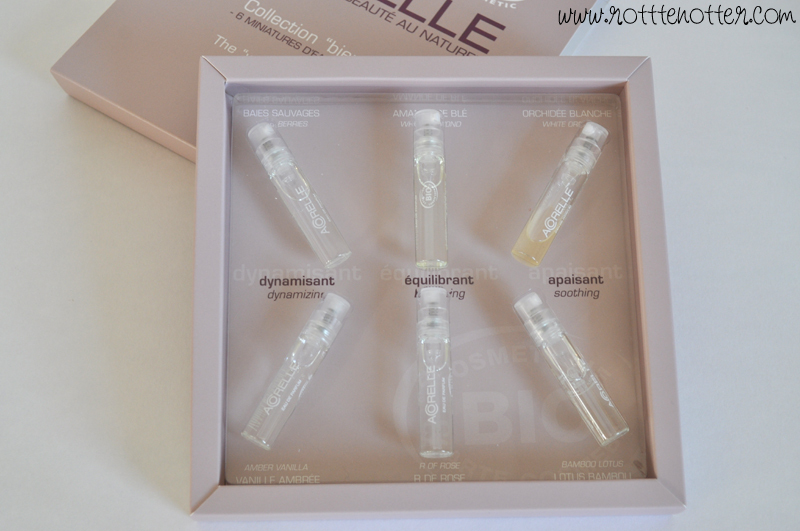 The set contains 2ml samples of six of the perfumes for £9.99. I think this is just a little bit too expensive, if it contained all nine perfumes to try then that would be better at only £1 per sample. I really like all the packaging, it’s set out really nicely and would make a perfect gift. 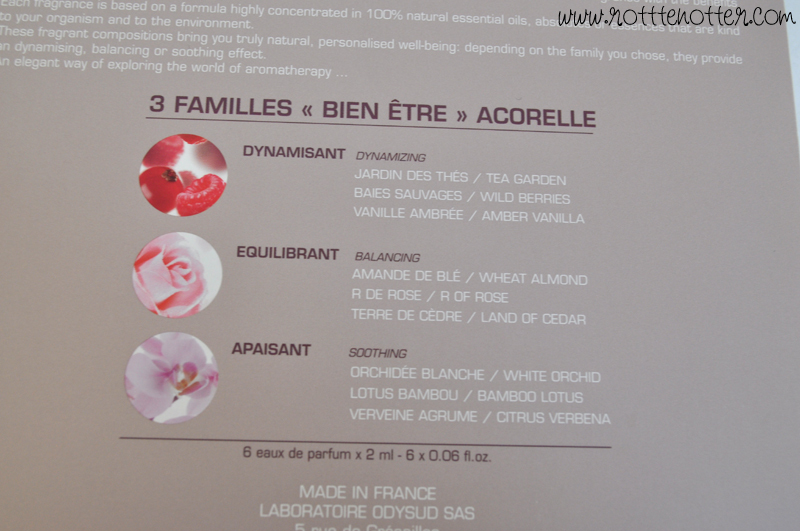 There are three families each containing three perfumes which you can see in the photo below. 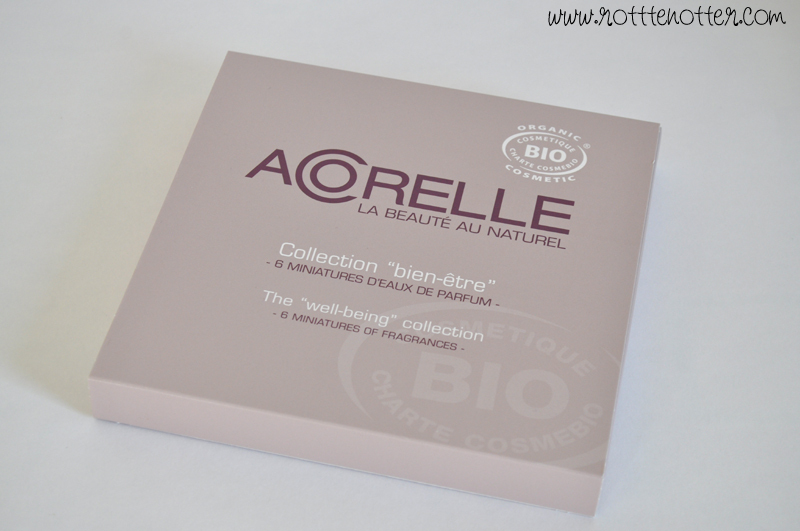 In this set you get Wild Berries, Amber Vanilla, Wheat Almond, Rose, White Orchid and Bamboo Lotus. Wild Berries - Family : Flowery Spicy Rose, Top Notes : cardamom, green note, Middles Notes : rose, mimosa, violet, Base Notes : sandalwood. This one reminds me baby powder mixed with parma violets. I’d like the sandalwood to be more prominent as it’s one of my favourite scents otherwise I’m overly keen on it. Amber Vanilla - Family : Vanilla, Top Notes : mimosa, Middles Notes : patchouli, almond, vanilla, Base Notes : peru essence. The vanilla isn’t too sickly sweet and obvious. I’m not entirely sure what amber smells like but it goes well with the vanilla. Wheat Almond - Family : Flowery Almond, Top Notes : bitter almond, palmarosa, Middles Notes : ylang, Base Notes : apricot, mimosa flowers. This is the one I like the least, it’s not a horrible scent but there’s something about I don’t like. If I was better at describing scents I’d be able to tell you which scent it was. Rose - Family : Flowery Fruity Rose, Top Notes : rosebud, geranium, Middles Notes : rose, freesia, Base Notes : raspberry. 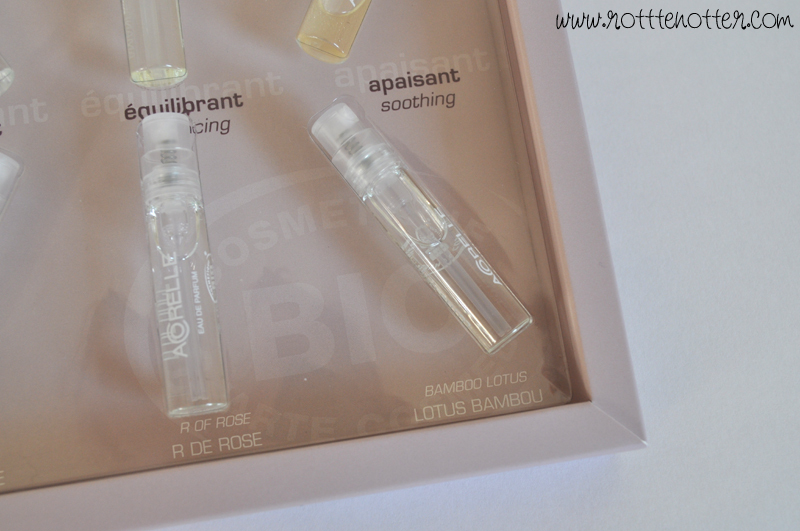 I’m quite fussy with rose scents, I either love them or hate them. This one is really nice and smells very similar to Naked’s rose shower gel. The other notes in this perfume tone down the rose so it’s more wearable. White Orchid - Family : Cyprusy Flowery Spice, Top Notes : cardamom, pear leaf, Middles Notes : iris florentina, hawthorn, Base Notes : patchouli, vanilla, raspberry. This one is too sickly sweet for me to wear as a perfume, it would work well as a room scent though. Bamboo Lotus - Family : Hesperidium Flowery Cyprusy, Top Notes : lemon, bergamot, mint, Middles Notes : orange blossom, violet, Base Notes : cedar, patchouli. I like the scent of this, reminds me of Lush but on my skin it only lasts half and hour so I wouldn’t buy it.